As a former Gym Owner and Aerobics Instructor, by the time Sue reached her 49th birthday she’d put her back through more physical activity than most would in two lifetimes. 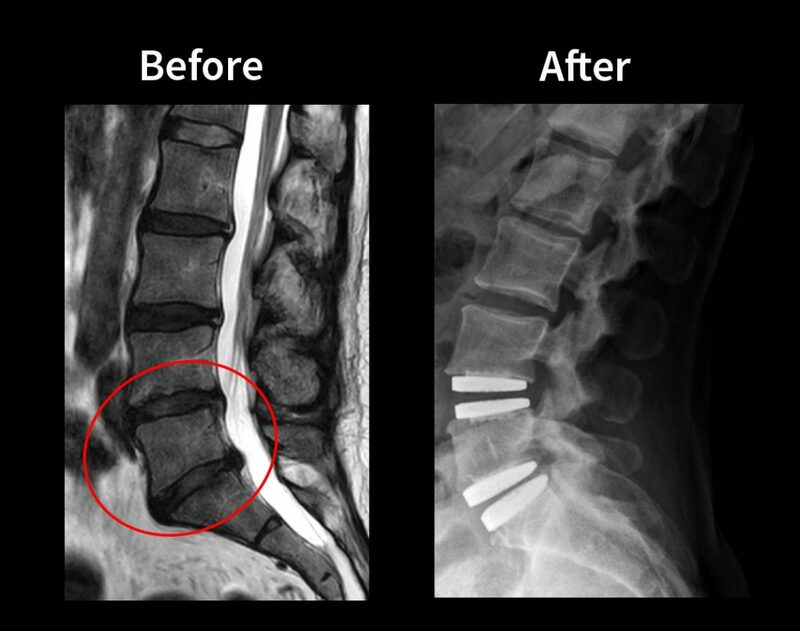 After seeing 3 spine surgeons in her area she was told she either required a 2-level spine fusion or she could have a motion-preserving solution with another model of artificial disc over two separate surgeries. We helped sue receive an assessment from our senior neurosurgeons in Germany, and they confirmed she was a candidate for L4/5 and L5/S1 Artificial Disc Replacement (ADR) with the very latest M6 Disc by Spinal Kinetics. This model is superior from older generations of artificial discs because it can move in 6 directions, including shock absorption, with an external sheath to protect the patient from wear debris. The M6 disc implant can accurately replicate the movement of a natural healthy spinal disc, and can safely be used at up to 3 levels of the lumbar spine or 4 levels in the cervical spine. Our surgeons Dr. Thomas Bierstedt and Dr. Bernd Illerhaus are very experienced in performing multi-level interventions within the same surgery, under one anaesthetic. After Sue received her Surgical Recommendation we put her in touch with previous patients from her country (Australia) who travelled to Germany for the same 2-level surgery, and they were able to share their experience from their own perspective. After returning to Australia Sue made the very most of her newfound mobility and reduction in pain. She enjoyed exercising every day, walking her dog, helping her husband with the family business, growing her confidence with Pilates and physiotherapy. She had some set-backs along the way, with feelings of restriction and being ‘locked up’ in her lower back and pelvis. We recommended consulting with a highly regarded chiropractor we knew in her home city in Australia, who had experience with lumbar ADR patients. After a few sessions of gentle SI joint manipulation, Sue felt instant relief and was back on the road to recovery. She bounced from strength to strength. She then finalised a 38,000 word fiction book (Pongo: Hands Through The Forest) which centres around a family of Orangutans in the forest of Borneo. Aimed at readers of all ages, her book is due for publishing in June 2018. Sue generously donates her time as part of our network of patient references, who put their hand up to talk with approved candidates about her experience travelling to Germany for surgery. Overseas medical treatment can seem quite daunting for most, and so important to have this option. We are forever grateful to have our growing support network of patients – Thank You Sue!